On March 3, 1992 along with the establishment of our independent statehood, a structure named Hayastan All-Armenian Fund was set up, which for the last two decades has been uniting potential of the Armenians worldwide, executing a unique mission in Armenia and Nagorno Karabakh, building and renovating hundreds of kilometers of roads, gas pipelines and water canals, modern hospitals, educational and cultural centers. 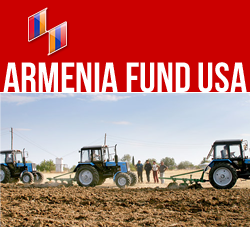 The Fund has walked this glorious path hand in hand with thousands of benefactors from Armenia, Artsakh and Diaspora, whose unyielding will and boundless dedication created infrastructures which are of crucial importance for our country. This jubilee symbolizes our joint accomplishments throughout these twenty years, the major and minor victories towards the prosperity of the Armenian people and development of our Homeland. On the occasion of this anniversary, I express my warmest congratulations to the Armenians all over the world and wish that our common dream of living in a prosperous and powerful motherland comes true.